Build your own DIY Crafting Cottage, She Shed or Garden shed. This is a sweet tiny house design to fit your backyard. A link to downloadable plans included. Build your own crafting cottage, also known as a She shed, but this makes a great garden or potting shed too. Do you have Happy Place? Got a spot in the back yard??? Build yourself one….like we did. My sweet husband and I built this lovely little cottage together. Building this crafting cottage or some would call it a she shed was so much fun and it gets constant usage. My brother in law helped too in setting it up on site. Truly a family affair. This would work great for an office for a business as well. It has been my favorite place to get away to ever since it was built in 2005, even when it looks like a tornado has struck inside. It has weathered all sorts of trials and tribulations..
From frigid snow…and lots of it.. When we first set it up there was nothing much around it but the tall, tall trees.. Hands down, even after 10+ years my little cottage/studio is still one of my favorite places to be. I have included a link to plans to build yourself one. This small cottage measures 12′ x 12′ on the outside. It includes 30 pages of step by step instructions with diagrams and links to helpful resources. NOTE: This is a digital product, nothing else will be mailed to you. Download and print for your personal use only. If you build one, I would love for you to share your photos with me. Off I go, to paint and create. Until next time… Happy Building! I have been wanting one of these for so long! Great space! It is a great space and well worth waiting for. If ever I have to move from this house I will have to take it with me. Somehow, someway! What a beautiful little studio. You bet I am printing off the plans! About five years ago my husband started to build me a little studio cottage. I should have been suspicious when it was built so close to the chicken coop. Turns out it was to be a house for new chicks – so much for my studio! Great! I hope the plans help you get your studio/cottage built. Send me pictures when you get it done, I would love to see it! What a cute little cottage to hide away in, doing all the things you love. Even as you say …. is in a mess . I’d love to have a haven where I could just leave everything I was working on ready for the next time. I’m sure you know where everything is 🙂 Happy painting. LOL, you are so right, I do know where everything is and can put my hand on it within seconds of needing it. 🙂 I had a grand time painting yesterday and I will do more this afternoon. How big is this space; what are the dimensions? Pamela, I love it! So much charm…on the outside:D. You will get the inside to match the charm on the outside soon. I have big plans on getting the inside whipped into shape and will blog it! For sure! This is precious! What are the approximate interior dimensions? Thank you all so much for posting these free directions!! Lucky, lucky girl! This is adorable! You must be so proud of the fabulous job you’ve done. Your wee cottage is a Small House Swoon! Your flowers make the cottage even more special! Like a lovely old English setting- All you need is tea and crumpets on the porch! I just turned a room in my home into a craft/sewing/painting space and love it- added a big window for lots of light- now if I just had time to get in there and “do my thing”! LOVE your spot! 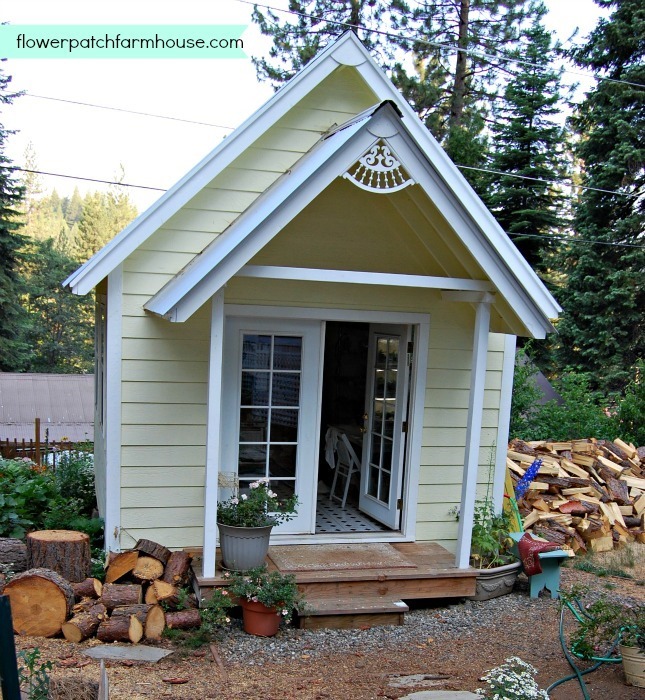 Love your darling lil shed, and it is hard to have everything looking great when you are busy creating…………. It looks great in all seasons, and what a blessing. Absolutely gorgeous! It’s the perfect size for my glass studio. Thank you so much for generously sharing the plans also! You are more than welcome, send me a photo of your studio once you get it done. I would love to see it. Too cute. I love it! The fact that it survives even cold seasons is good news! Do you work in it in the Winter? How do you keep it warm in there? Yes, I do work in it in winter. I have a little radiant wall heater that is 400 watts that runs 24/7 in mid winter and if I need extra heat on super cold days I have another little heater to turn on. My studio is well insulated so it does well. It costs me about $40 a month in winter to keep it heated. Our lows in winter average in the low 30’s sometimes lower. I paid for the plans to build the shed, but could not figure out where and how to download them. What a fun cottage. Love your flower garden near it. No wonder its a favorite place. This is beautiful. Love it. Such a lovely colour too. I love your cottage! It’s wonderful! Kisses from Italy. Paola T.
A long time dream of mine is to have a little cottage just like yours. We live in a little cottage at the beach where the lots are super small so there is no room. What kills me is that at our old house, we had a shed where a former owner had birds. It had electricity and running water. Boy, if I still lived there, it would be the absolute cutest little cottage for crafting. Bummer about having a too small of a lot but living on the beach almost makes up for it….right??? It’s darling, and I can see why you love it. Thank you so much for the free plans! You are more than welcome. I love sharing it. GORGEOUS! Wow, I would cry if my husband built that for me. He has a shed, but I would love a little house like this right beside his. Plus it would get all of my crafting stuff out of the house! I am sure your husband would love to build you one. And it is so nice to be able to leave the studio cottage, shut the door on the work in progress when you have to go back to the house. Adorable,….um yes downloading and pinning! I’ve been dreaming of having a little cottage space in my yard for years! I dreamed for a good long time too…so here is to dreams come true! One day, when I have a house, I will do this. Consider it pinned. Welcome Romy, I agree, it is a fabulous spot to create. Looks like my craft room inside! 🙂 What a cute little crafting cottage. My dad has been building a huge playhouse out back for my two girls, but now I think I might take it over when they grow up! Great idea. What a great grandpa! We had a playhouse at our grandparents house, it was a simple little thing but we had more fun in it. Pamela, I love your happy space! I have a craft room, but a potting shed is on my wish list. I have the perfect spot set aside up on a hill. This is so darn cute. Love it! A place like this would make anyone smile. Have fun creating. The cleaning will wait! Thanks for sharing with SYC. I will be featuring you this coming week. it’s very adorable but how can you get anything done? It looks like a doll house, how much fun to have your very own private creative space! This is just wonderful and thank you for showing us the inside. Your Mr. is very talented. Yes he is, and I love him dearly. It is a great place to create, everyone needs one. Visiting and pinning from the Sabbilicious party. Love your cottage and your backyard! Thanks for the inspiration. That is adorable!! 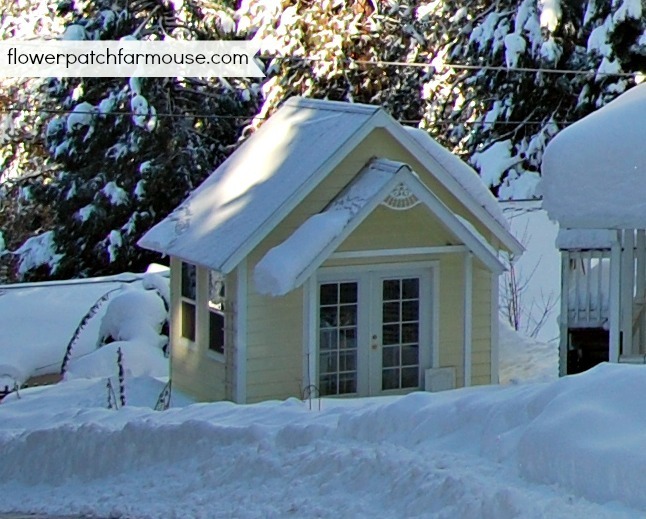 It looks like a minature dollhouse in the one picture where it is covered in snow! What a great space to create in!! It is very lovely to be in when the snow is falling and rain, for that matter, the rain makes the most melodious sound when hitting the tin roof. So cute & you are so generous! I’m featuring your cottage in the Power of Paint Party spotlight this week. Thanks for linking up. Amazing! Just amazing! I am so pinning this for one day in the future for I don’t know when, lol. Thank your husband so much for making up these plans. I would love to make this some day. It is a great addition to anyone’s property, I dreamed a long time before I got mine but here is the dreams coming true!!! Keep on dreamin’. Oh wow. This is just heavenly! What an adorable little cottage creative space Pamela. I love that you have shown her in all seasons too. Thank you for sharing this post at Shabbilicious Friday. I’m featuring it at today’s party. Cottage Pamela. Creativity isn’t always tidy (at least that is MY story and I’m sticking to it). Despite the ‘untidiness’ I know exactly where everything is. Though I have been working on tidying it up a little each day as signs ship out. What would you say is the average cost to build? We built this 8 years ago so it is hard for us to estimate by todays prices. But for reference, with it completed with the interior done too it was approx. $5000. I am so into tiny spaces. I had a tiny home built that is 8 feet wide by 18 feet long. There is an attached 6′ x 8′ covered front porch making the total of my tiny house 24 feet long. It is on wheels so it can be moved anywhere. I would love to see the plans on your tiny garden shed but am not able to locate where I can obtain them. Thanks for sharing this darling little space. I especially love the gingerbread work. It adds a lovely touch. There is a link in my side bar, it is the photo of my studio. That will take you to the file to download. Your little house sounds fun. What a beautiful little house! I loved seeing the inside, too (it’s so real!). Nice to have stumbled upon your blog! The inside is slowly coming together again, it goes in waves, messy then a bit tidied up. I am getting my sign orders shipped out so that helps to eliminate what looks like clutter. I am frothing at the mouth to start my first outdoor building like this! I want to make my first one into a ‘guest cottage’ and then go from there, since we have 42 acres. They sell these pre-fab wood sheds all around here, complete with porches, front doors, etc (you can pretty much choose the layout, size, number/style of doors windows, size of porch, type of roof, etc. – they start at around $3500 and go up a bit more. They even do 3 year, ‘no credit check’ financing on them. This type of outdoor space is HUGELY popular for all sorts of things like guest accommodations, crafting, potting, etc. My real dream is to start a business designing and selling these tiny outdoor buildings. I’ve already collected some vintage appliances and kitchen sink bases for when I finally get my first building, which will be a ‘studio’ apartment type building with a Murphy bed. Still trying to figure out which way to go with the ‘plumbing’….but maybe for now, people can just come inside to use the loo. We always figured we could live in it if we just added a ‘loo’. 🙂 I think that would be a great business. Get the costs down by doing it in bulk and you have a winner. I love sharing my ‘little getaway’ spot. It still looks like a tornado struck inside and my goal of getting it cleaned out continues on the back burner. We have talked about putting in a “water closet” out the back with a composting toilet but that is still just talk. The exercise running in to the house to use the bathroom is good for me anyways. Thank you so much for taking the time to share and let me know how much you enjoyed my little cottage. 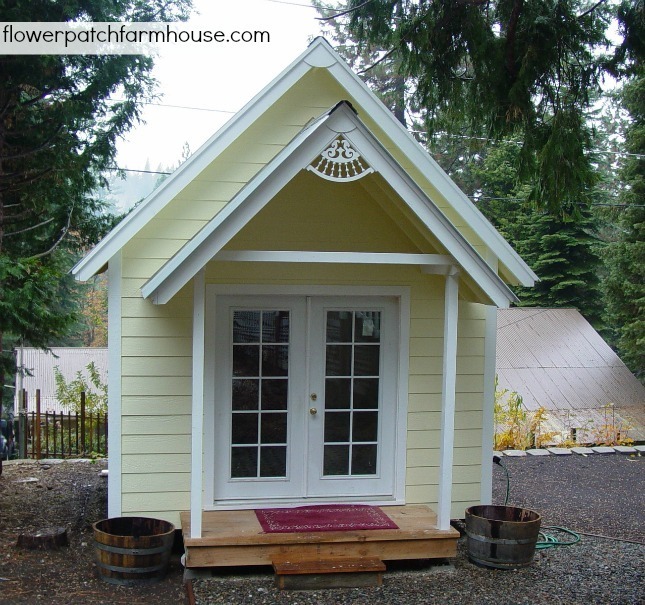 I have just started looking at small, or micro houses, including shed plans that I can convert into livable space. Your design is well thought out and looks very nice. Congrats on a nice build! Thank you, most of the credit goes to my husband, he is the brains behind this build. Oh my gosh I love this garden shed idea. Building a new one is on our Summer of 2015 Must Do List. I’m definitely pinning yours for inspiration – thank you! P.S. I just downloaded your PDF Plans and I must say they are pretty impressive – thank you so much! What a pretty little cottage. I would love to have one some day. But I guess for now I’ll have to stick with my craft room. But I’m grateful that I at least I have a room of my own and not a corner somewhere. We’ve recently moved so my craft room is still a work in process. I want it in order not like my old craft room. It looked like 10 tornados hit it LOL. I do have a large closet and I bought lots of clear plastic tub to get it in order. So for now that will do and I’ll have sweet dreams of having a cute little crafters cottage like yours. Oh and I love all your pretty flowers! Loved the crafting cottage. Great inspiration! It is a fabulous place to create and relax. I can’t express how much I enjoy my little cottage! Truthfully, it is worth it’s weight in gold. I love my little ‘getaway’ cottage! This is so lovely and look similar to the play house my girl used to have even same color! I miss it! Before we moved I would of loved to turn it into a craft room. You did a lovely job! Found you today via the Wake Up Wed Party! 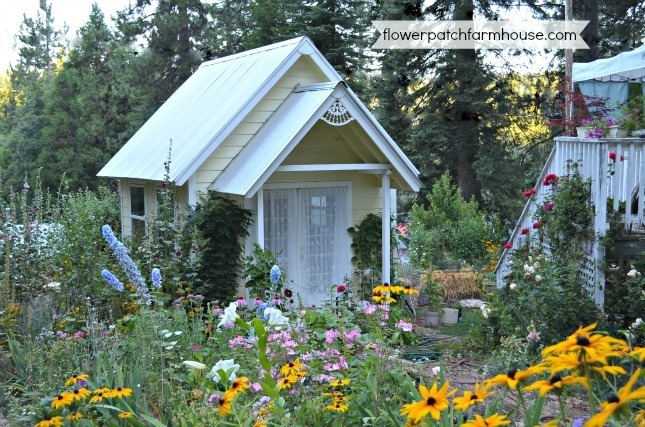 Pamela I adore your garden shed and am featuring it this weekend at the DIY Sunday Showcase Party. See you there! Thank you so much Marie! I appreciate that. I will be back to link again. 🙂 Thank you for hosting. Congratulations for being featured on this weeks DIY Sunday Showcase! Love your studio/cottage!! thank you so much, I need to hop on over and see! It is a fun place to be. What a lovely little hideaway! It is the BEST little hideaway. It needs a bit of cleaning and redoing inside right now but that is just plain fun! Cute house. Been looking a small building to turn into a hot yoga studio and ballet barre room for my three ladies. I bought the plans. They are great but I need to modify just a little for the uber insulation. I could use a little clarification on the rafter blocking and the top plate. Pics would work or if you have drawings, that would be great. Also, thinking about reducing to a 10/12 pitch on the roof to match the main house. I can figure out the rafter design but and interested in your opinion of the aesthetics of the slightly less aggressive roof? Thanks, I’ll send pictures when I’m done in about a month, or a year! I am not sure how to clarify the design for you, sorry. And all the drawings I have are included in the set. I think changing the pitch of the roof will work just fine, we had it taller to add the loft for storage. You may have mentioned it, (I did not read all the replies) however can you share the brand and name of the yellow paint that you used? Thanks in Advance. The paint is Behr by Home Depot and the color is Moonlit Yellow. I have had it on my house and studio cottage for 10 years now and still love it. This is such a cool idea! I would love to do something like this in the future…when we don’t live in a condo! You guys chose a beautiful design, too! Thanks for inspiring me! My husband designed it. I told him what I wanted voila he came up with this. I loved it and the little front porch is perfect to sit on in the evening to relax. I love it more each day! Best of luck on the clean-up! I enjoy doing my crafts projects and making gifts for loved ones, but I also enjoy organizing and cleaning up afterward. It always feels good to see everything all clean, neat and in its place, even though it may not stay that way for long! Here’s wishing you enough energy to tackle the job! I love a clean and tidy space as well, I am so much more productive. I have just gotten too many things going at once and I need to reel myself back in. The first thing is to get the studio cleaned out and up. It has been raining again so that puts a damper on things since I have to move stuff outside. But it will get done, that you for the energy wish, that is a good portion of what it takes, energy! I ordered this plan and want to build it for my beadwork I’m getting involved in. It’s so hard to get a second income coming in but if I don’t make any money at my new found hobby at least I’ll have something to show for my efforts and they will look so lovely in this little cottage. Thank you so much for the plan. You are most welcome, Shirley. It is a great investment no matter how it all turns out.